Researchers in Nepal used drone images to survey critically endangered gharial crocodiles along the banks of the Babai River, comparing their results to those of multi-team ground surveys. 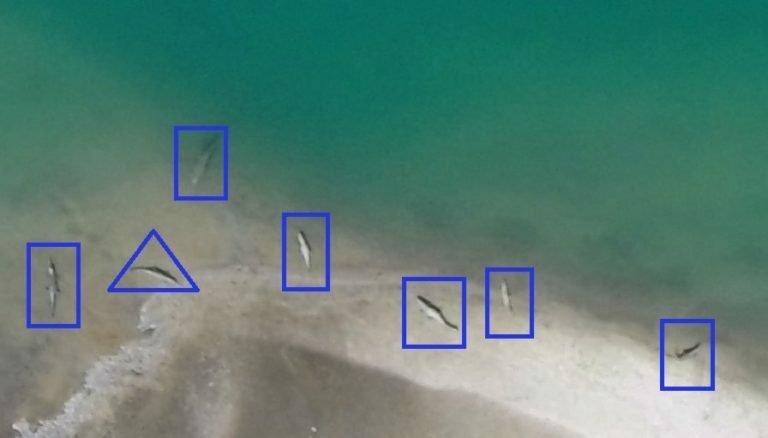 Analysis of the drone images produced counts of gharials and mugger crocodiles similar to those of ground survey teams, in less time and at a lower cost. The researchers stressed the importance of conducting aerial surveys when environmental conditions are most conducive, such as during the winter months when water clarity in the Babai River enables counts of gharials just under the water’s surface. The survey looked easy on paper. All they had to do was to go the Babai Valley in western Nepal and fly a drone (or unmanned aerial vehicle, UAV) along a river. But wildlife researchers Gokarna Jung Thapa, Eric Wikramanayake and Suraj Karki soon realized that their work was fraught with elephantine challenges. “Our mission was to fly a drone over the Babai and take photos of gharials (Gavialis gangeticus) basking on the banks of the river,” said Thapa, who along with his team visited the valley in January last year. The wild elephants did not like the idea. “Our vehicle was chased by a herd of wild elephants,” he said. “We had to speed uphill and request a truck-load of soldiers to rescue us that day.” Despite the rescue call, the resources Thapa and his team members used on their mission to count gharials were minimal compared to similar missions in the past. A pair of gharial crocodiles resting on the bank of the Babai River in western Nepal. Image courtesy of Gokarna Jung Thapa/WWF-Nepal. 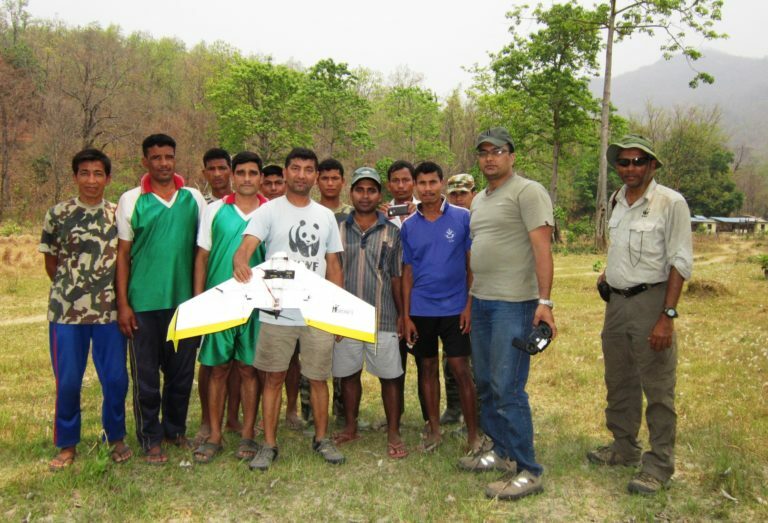 It all began in early 2017 when Thapa, who works for WWF-Nepal, was looking for ways to put to use an FPV Raptor drone procured by his office. The drone was initially bought to assist army units patrolling the national parks. However, due to frequent change in personnel and lack of adequate training, the drone was not being put to optimum use. “That was when I came up with the idea to count gharials using the drone,” Thapa said. 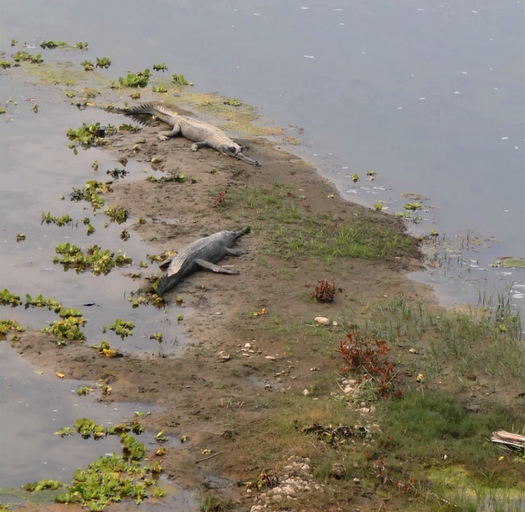 The drone did not bother these gharials basking on the rocky banks of a narrow section of the Babai River in Nepal. Image courtesy of Gokarna Jung Thapa/WWF-Nepal. The third reason they liked the idea of a drone survey was that gharials form long lines along the banks of the river. This forced enumerators in earlier counts to cover long distances, but if they went too close, the animals would retreat into the water. The researchers knew they could not just walk in with their drone any time of the year. Researcher Kanchan Thapa, a co-author of the paper, says that for a species like the freshwater gharials, winter (January and February) is the best time to conduct aerial surveys. “This is the time when the water in the river is less turbid and gharials swimming above or below around 1 meter from the surface of the water can also be counted,” said Kanchan Thapa. “We chose mornings (0800–1100) and evenings (1500–1700) to capture the photographs, as these are the basking times for crocodiles,” he explained. The researchers flew the drone at a speed of 10–12 meters (33–39 feet) per second, along 12 pre-designed missions for 2.72 hours of flight time covering a total of 102 kilometers (63 miles) of riverbank habitat along the Babai, which flows through the Bardia National Park. The camera on board the drone took 11,799 photographs covering an effective surface area of 8.2 square kilometers (3.2 square miles) of the river bank. 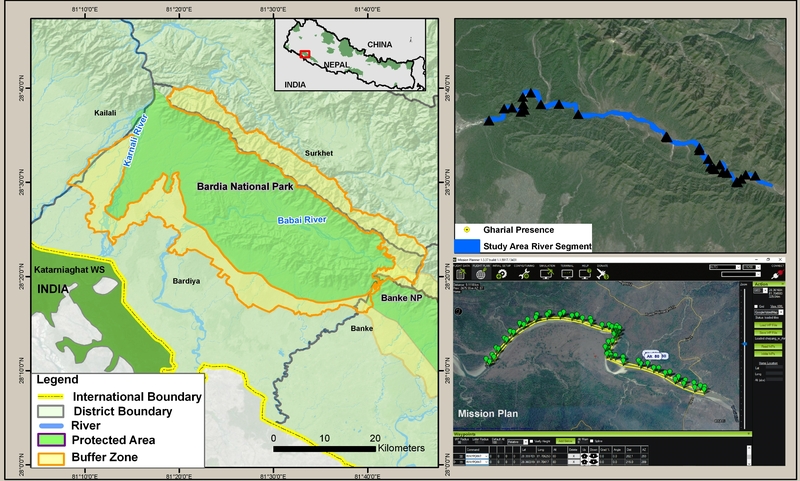 Location of Bardia National Park in western Nepal, together with the drone flight plan. Image courtesy of G.J. Thapa (2018) Counting crocodiles from the sky: monitoring the critically endangered gharial (Gavialis gangeticus) population with an unmanned aerial vehicle (UAV). Journal of Unmanned Vehicle Systems. “With drones flying at an altitude of 80m [262 ft], the gharials didn’t even notice that they were being photographed,” Gokarna Jung Thapa said. This was one of the main challenges of the fieldwork. However, the area they were surveying lies inside a valley, so they could not fly the drone from a higher altitude, where there is less risk of wild animals. Researcher Gokarna Jung Thapa leads a training session for security personnel to use UAV’s to monitor wild animals in Bardia National Park. For the gharial study, the fixed-wing drone carried a small camera and took nearly 12,000 images. Image courtesy of Gokarna Jung Thapa/WWF-Nepal. Once their fieldwork finished at the end of February, they began to analyze the images. This was the most difficult part of the whole endeavor, said Kanchan Thapa. Gokarna Jung Thapa and his team assembled the photographs and carefully searched for the presence of gharials and mugger crocodiles (Crocodylus palustris), a species that shares its habitat with gharials. They selected 7,708 photographs (66 percent) of the 11,799 for stitching. As they flew the UAV at an altitude of 80m, the researchers could not only count the number of gharials and muggers, it could also distinguish between the sexes. “We could have also estimated the approximate age of each individual gharial, but that was beyond the scope of our project,” said Gokarna Jung Thapa. The images approved by the analysts were then screened using counting software (Dynamic Venture, Inc.). Three image analysts then separately searched for crocodilians in each of the stitched photographs. 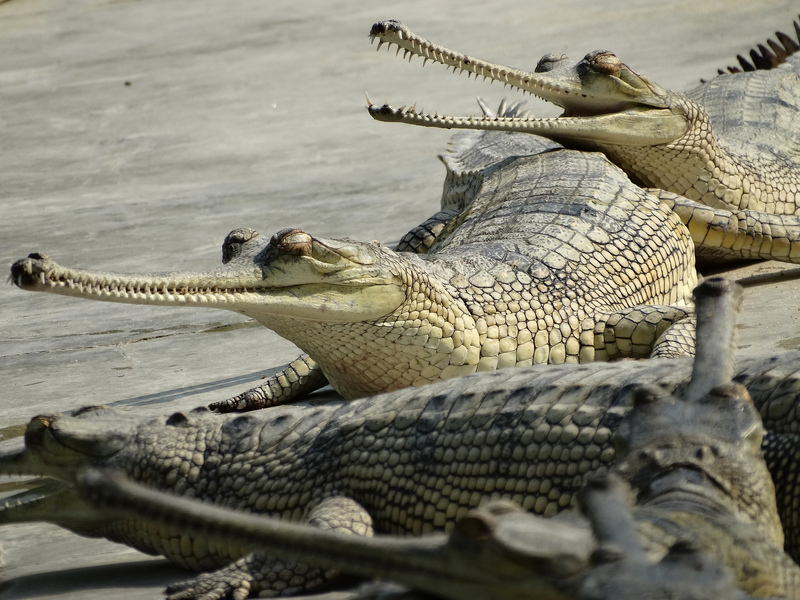 “Collectively, there was consensus with a total of 64 crocodiles counted (33 gharials and 31 muggers), irrespective of age groups, and they were found spatially distributed in clusters along the Babai river bank,” wrote the authors in their paper. 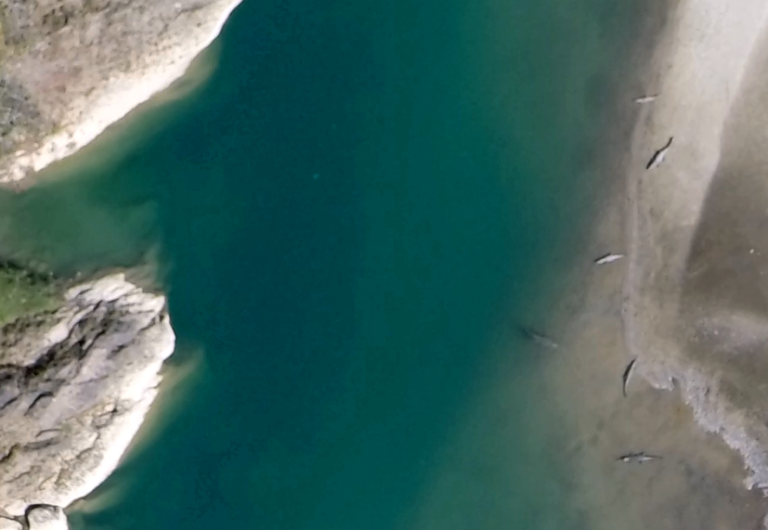 Gharials spotted by the drone-mounted GoPro camera during a flight over the Babai River. The clearer winter-season water allowed researchers to count gharials both on the bank and just below the water’s surface. Image courtesy of Gokarna Jung Thapa/WWF-Nepal. “We compared the UAV-derived count data with data from three replications collected from conventional gharial surveys conducted in 2016. We also compared the gharial count data with data collected over multiple temporal surveys carried out in the winter season at different time frames employing visual encounter surveys,” said the authors. The figures were found to be similar. Gokarna Jung Thapa is content that the study has shown that UAVs can be used to count freshwater species such as gharials. Kanchan Thapa believes that the same methodology could be used to count and monitor the endangered greater one-horned rhinos and other species that move slowly in the wild. As seen from above: an image taken by a drone-borne GoPro camera of gharials in the water and on the sandy banks of the Babai River. Image courtesy of Gokarna Jung Thapa/WWF-Nepal. Gokarna Jung Thapa said he wants to conduct a similar count in Chitwan National Park in central Nepal. Before that, he hopes to figure out a way to keep the elephants at bay. Thapa, G. J., Thapa, K., Thapa, R., Jnawali, S. R., Wich, S. A., Poudyal, L. P., & Karki, S. (2018). Counting crocodiles from the sky: monitoring the critically endangered gharial (Gavialis gangeticus) population with an unmanned aerial vehicle (UAV). Journal of Unmanned Vehicle Systems, 6(2), 71-82.